IMPUNITY AND PROVOCATION OF THE EZLN: A GLOBAL OFFENSIVE? Compañero Galeano. Justice not revenge. Once again it is demonstrated that we live in times of impunity without concessions. The Zapatista commanders justifiably and indignantly acknowledged that they don’t have any reason to trust in the justice of those above. Justice that lamentably doesn’t have impartiality and objectivity and that, dealing with social movements or sectors extraneous to the political and economic elites, systematically eludes the historic truth or fabricates it, like in the Ayotzinapa case. with the argument that “the witnesses retracted their statements and that the agent of the Public Ministry did not witness the dead body” of the Zapatista ‘little school’ teacher. He asserted that there also exist 10 arrest warrants for members of the Cioac-H –accused of being involved in the events– that have not been executed, despite 15 months having passed (La Jornada, 22/8/15). 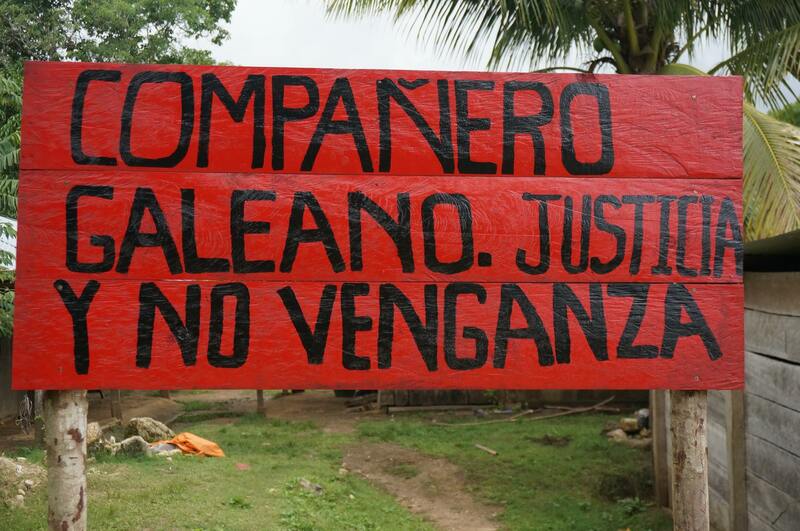 We remember that on May 2, 2014, members of the CIOAC-H murdered José Luis Solís López, the teacher Galeano, a Zapatista from La Realidad community, with firearms and machetes. The Zapatista comandancia pointed out at that time that: 1) we’re dealing with a pre-planned attack, militarily organized and carried out with perfidy, premeditation and advantage. And it is an attack inscribed in a climate created and encouraged from above; 2) the directors of the so-called Cioac-Historic, the Green Ecologist Party (the name with which the PRI governs in Chiapas), the National Action Party and the Institutional Revolutionary Party are implicated; and 3) at least the state government of Chiapas is implicated. It lacks determining, they pointed out, the degree of involvement of the federal government. Today, as in the case of Acteal, they once again justify resolutions in counterinsurgency logic under the generally practiced failures of due process. We cannot assume that we’re dealing with a decision foreign to the political intentionality of provocation towards the EZLN and specifically towards the Zapatista bases in the emblematic La Realidad community. Apparently, they seek to inflame the local confrontation with paramilitary support, in order to impede articulation with other movements that are organized in resistance within the country, like the Yaqui, Xochicuautla, Ostula, Ayotzinapa or the democratic teachers, among many others that the Subcomandantes point to in their comunicado. Nor is this scenario foreign to the very soon-to-be-announced project that Enrique Peña Nieto will send to Congress as an initiative for authorizing the federal Executive in his decision to create special economic zones in Oaxaca, Chiapas and Guerrero, with the argument of facilitating strategic transnational investment and, according to what the Treasury Secretary said: “One does not observe in those states the positive (sic) effects of the Free Trade Agreement entering into effect and of the insertion of Mexico into globalization.” They add that now welfare and extreme poverty will be overcome. They are going for everything over the territories and their plan against the indigenous peoples is underway. That is the meaning of re-activating the tension in La Realidad to extend a local circle local around the EZLN; of defending the Army at all costs in the Tlatlaya, Tanhuato, Apatzingán and Ayotzinapa cases; of keeping the Yaquis Mario Luna and Fernando Jiménez in prison, as well as Nestora Salgado and Cemeí Verdía, of concentrating 15,000 members of the Federal Police in Oaxaca to contain the teachers’ protest. All that while the mantle of impunity is extended, self-exoneration and self-forgiveness are announced in the so-called Casa Blanca case and the ineptness and chain of complicity is exhibited in the escape of El Chapo Guzmán, which will not be included in the next Presidential Report. The coming months will be crucial to stopping this offensive. The Zapatistas said well in their recent seminar Critical thought versus the capitalist hydra: things are bad and they are going to get worse.